The amazing bouquet of flowers that you see above is the Teleflora's Luxurious Lavender bouquet that is part of their Mother's Day selection for 2016. This post is a rather emotional post for me and I am tearing up as I type away at my computer's keyboard. It is my very first mother's day without my mother and just like most children, I thought that my mother would have been around forever. While I knew that it wasn't realistic, I did hope that my mother would be around much longer. My mother was what you would call a housewife back in those days. She took care of the home and made sure that all 3 of her children were taken care of. She helped with homework, made sure that we had our meals, all 3 of them (breakfast, lunch and dinner), we had a roof over our head and clean clothes to wear, she did it all. How she made it all happen, I have no idea, but I do wish that I was half the woman she was. I try my best, but I have to admit that I am still not quite there. I was very close to my mother and we spoke daily, except for the day that she passed away and I will always regret not picking up the phone earlier that day, instead of saying "I'll give her a call later". We don't know how long our parents, in this case, with it being mother's day, how long our mother's will be there. One day they're fine and the next day they're gone. Don't take mother's for granted and wait until Mother's Day to make that phone call or send that bouquet of flowers or even say "I love you". Being a mother is no small feat, whether you're a single mom or have a partner to help you. We wipe the tears away, kiss the boo-boos and a mother's love knows no bounds. A mother's job is never complete and even when the kids are grown up and have moved away, we still worry, because that's what mother's do. Our job is tough, but it is also fulfilling and I wouldn't change being a mother for anything in the world. This Mother's Day, Teleflora would like to honor all Moms with flowers because they realize that a mother's work is never done, we work 24hours a day, 7 days a week on a job that's incredibly rewarding but also tough. To celebrate they have designed these gorgeous Mother’s Day bouquets which are professionally-arranged and hand-delivered by a local florist with love and care to capture the hearts and appreciation of every mother, grandmother, aunt, sister or friend. Here are just a few of my favorites. This is the perfect gift to celebrate mom and tickle her pink! Just look at that elegant bouquet just brimming with some of springtime's finest colors. Featuring hot pink roses, miniature pink carnations, huckleberry, lavender stems and lavender chrysanthemums all nestled within a gorgeous blooming flower and hummingbird vase. This is the ultimate symbol to show mom your appreciation and love. This is the one that I received and the photo online doesn't do it any justice at all. What you receive is even more beautiful than what is shown. Just look at my own photos! 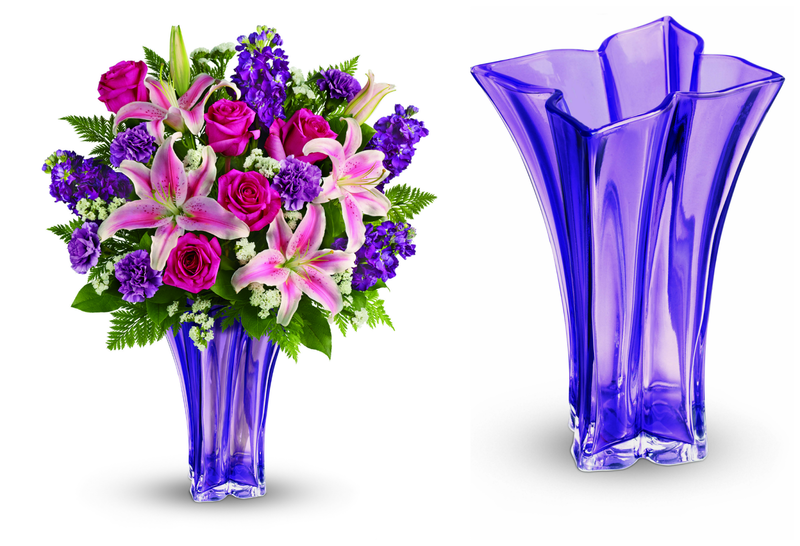 You would certainly “WOW” your mom with this stunning bouquet that truly exudes classic elegance; and dazzles and delights with fresh blooms full of luscious dark pink roses and fragrant lilies within a glorious sculpted lavender glass vase. 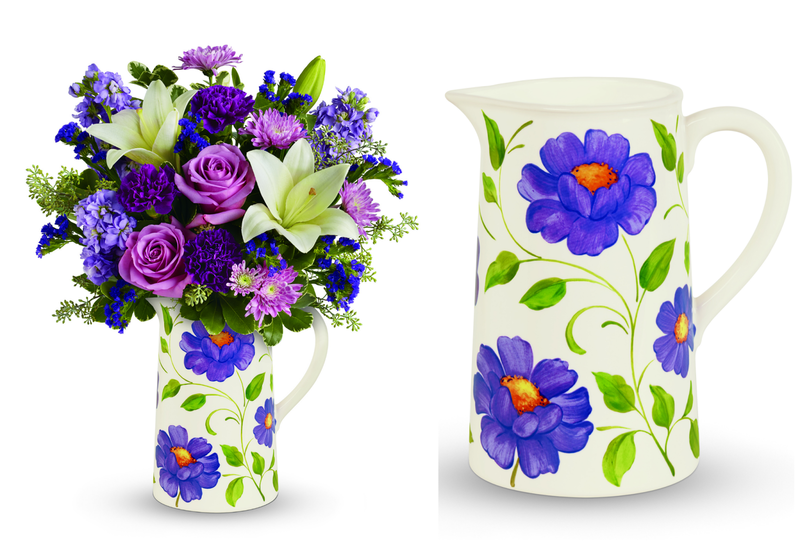 If you have a mom that loves gardening, then the Garden Pitcher Bouquet would make the perfect gift for her. Honor her timeless devotion with this charming 2-in-1 gift she will love and cherish for years to come. Filled with a luxurious mix of rich lavender roses and chrysanthemums, fragrant white lilies and eucalyptus, this gorgeous bouquet is hand-delivered in a tall, rustic Provencal-style water pitcher (FDA-approved and food safe) that is perfect for mom’s springtime entertaining. Do you have a mom that just loves her cup of joe in the morning? 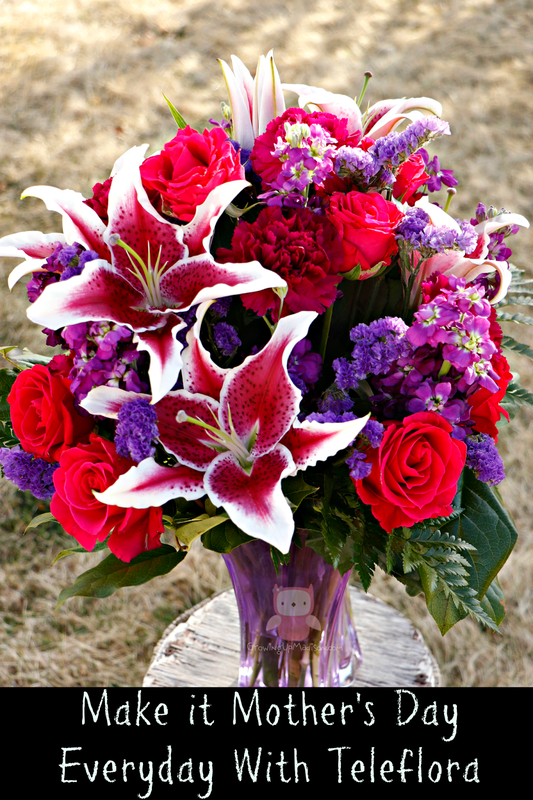 Then the Butterfly Sunrise Bouquet may just be the one she would appreciate the most. Playful and sweet, just like mom, this brilliant bouquet of peach roses, yellow alstroemeria, and lavender chrysanthemums will make every mom’s heart flutter with happiness. 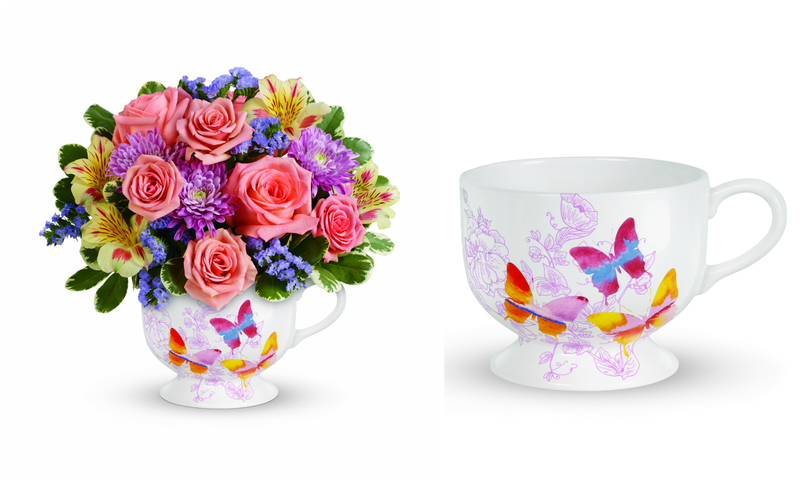 This 2-in-1 gift also serves as a darling oversized keepsake mug (FDA-approved and food safe) adorned with dancing watercolor-hued butterflies for long-lasting enjoyment. And finally the Painted Blossoms Bouquet. Surprise sisters, daughters, and new moms by showering her with a bright, joyful floral bouquet bursting with a lovely medley of orange roses, yellow alstroemeria, and brilliant pink carnations. 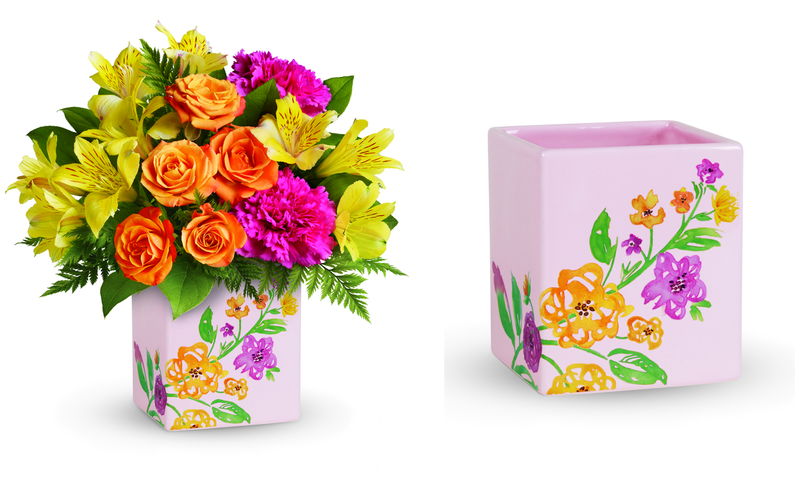 This arrives professionally-arranged in this delicate pink ceramic cube vase with painted blossoms complement the fresh blooms of spring! 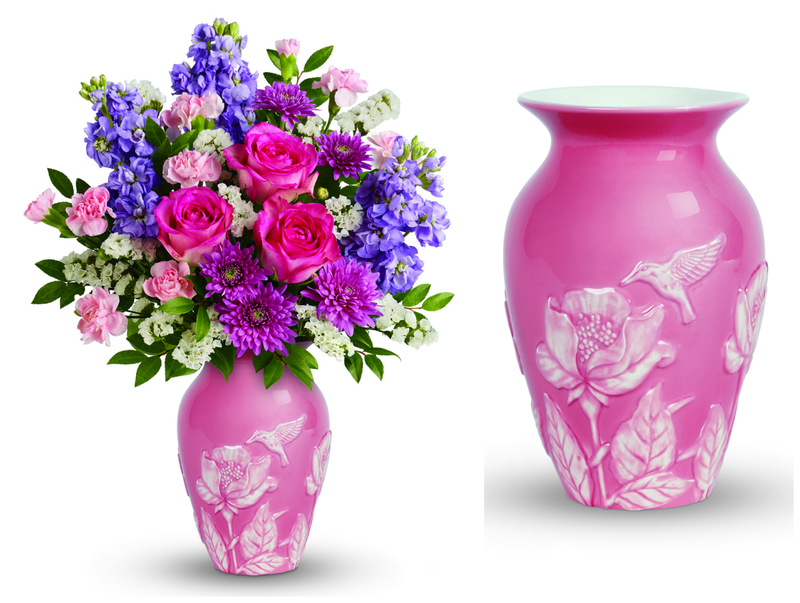 This Mother's Day show your mother that you love her with a beautifully arranged bouquet of flowers from Teleflora. Let's Make it Mother's Day - EVERYDAY! Let's discuss: How do you celebrate your mother on Mother's Day? 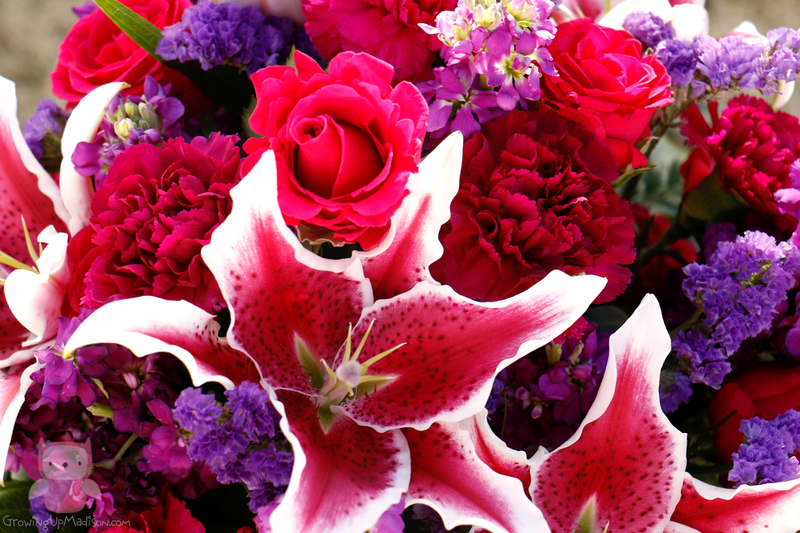 Teleflora would love for one of you to win a beautiful bouquet to honor your mother. Your bouquet is sponsored and will be delivered by Teleflora. The winner will have 48hrs to respond to the winning email. Failure to do so will mean forfeiting your prize and a new winner will be chosen. Good luck! Telefloras has some gorgeous bouquets. It is really hard for me to choose one that I would want! That's the thing about Teleflora isn't it, choosing the perfect bouquet, because they're all perfect. The butterfly sunrise bouquet is exactly my kind of arrangement. Love it! Hugs to you this mothers day. I bet you will find a perfect way to celebrate your mom. That bouquet truly is beautiful and yes I'm already thinking of a way to celebrate. They have the cutest arrangements and it's so convenient to use Teleflora because we live so far from both of our moms. I personally love the teacup/coffee cup bouquet. The teacup is beautiful and Teleflora does make it convenient to connect. Teleflora has such beautiful bouquets. Who wouldn't want to receive on of these for Mother's Day or even just because? Yes who wouldn't? I know that I just love receiving them. I absolutely love Teleflora. I've used them before, and their blooms are always beautiful and in great condition. Oh and they seem to last forever. I had one that lasted almost an entire month. LOVE THEM! All of those flowers look absolutely gorgeous. I cannot wait to get my mom something for Mother's Day and her favorite thing to get is flowers. That is great and I'm sure that she would love whichever you decide to get her. I love Teleflora! Their vases especially are to-die for! Tell me about it. Besides their beautiful floral arrangements, it's always a struggle picking out which vase I love most. We get together and have a cookout on Mother's Day. That surely is a great way to celebrate Mothers' Day. Thanks for sharing that. Oh how nice. I like the look of a nice floral arrangement. Thank you Lilith, so do I and Teleflora has some of the best arrangements you can find. It isn't to celebrate Mother's Day without you mom. These flowers are gorgeous. Teleflora always does a beautiful job of creating unique bouquets. They sure do and I will be celebrating this year without my mom and I know it'll be tough but it'll be ok. Your mother sounded like a lovely person. I hope you have a great Mother's Day! I really like the lavender arrangement you received. Thank you Liz, she truly was and the Luxurious Lavender is amazingly beautiful. Reading this made me appreciate my mother more. They are indeed gems and someone we would always look up to even after they're gone. Don't feel bad for not calling, I'm sure she understands. I love these selections they are very lovely and fit for the best woman in our lives, definitely. Thank you and I think I feel especially bad because I so wanted to hear her voice just one more time. Don't take anything for granted. Lesson learned. love to read this. i myself is guilty of not answering my parents call or skype sometimes. this made me realize that i need to reply whenever, coz they won't be around forever. love the beautiful flowers, sending one to my mother and mother inlaw too! They sure won't and I'm sure they'll appreciate getting some flowers this Mother's Day or any day for that reason. Those flowers are all beautiful and lovely. I am definitely sure all moms would love these. Yes I am pretty sure that they would. I am so thankful for being able to send flowers to those I love even though I live so far away from them. I know on more than one holiday, I was able to make sure no one was left out in being recognized and remembered. That is awesome and I'm so glad to hear that you're able to do that. And you'll be that amazing grandma that you already are! They really do have some beautiful flower arrangements. Maybe the hubs will get me some for Mother's Day, too. I hope he does but if he doesn't maybe the boys might. That is so cute and beautiful. I'm sure my mom will love to display this at their house. I need to check that out! I'm pretty sure that she would and knowing that they're from a daughter who's thinking of her would make it even more special. Beautiful flowers! I love sending my mom a nice bouquet! How sweet and I know she appreciates the gesture. Our plans for Mother's Day are to take mom to dinner and give her cards and gifts. That's an amazing plan Heather and I know she loves it when you do. The vases and containers are so beautiful and a gift in themselves. I think they add a lot to the presentation of the flowers. They sure do and the receiver would also love them. These Mother's Day Teleflora arrangements are absolutely beautiful. I received a bouquet from Teleflora last holiday season and I was very pleased with how lovely it was. It is always so nice to receive flowers for any special occasion. Teleflora has never disappointed me ever. I just love the arrangements myself and I know whenever I'm sending a flora arrangement, they're the ones I pick every time. So very sorry to hear about your mother. Sounds to me like she was an amazing mom. My mom is alive but I haven't seen her since I was 6 years old. This post reminds me how precious life is and I really need to go see her. 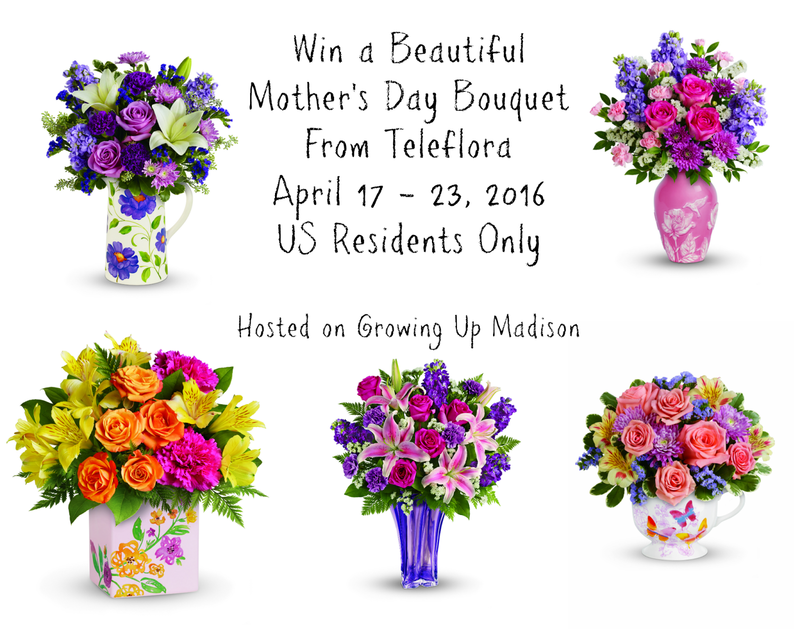 The Telefloras flowers are simply gorgeous and any mom, myself included, would be happy to receive them. I especially love the Butterfly sunrise bouquet one. Oh she truly was Marielle and oh how I wish she was still here with me today. You need to pay your mom a visit, I'm sure she misses you and would love to see you. Yes they are and they sure will brighten up any home decor. Those are all so beautiful, I would love to get flowers for Mother's Day. The teacup is definitely my favorite, I can already think of a great way to use that teacup in a project I am currently working on! Oh that one surely is beautiful and it is also one of my favorite. Love these arrangements. Flowers are such a wonderful way to celebrate special occasions. Yes they truly are and there is no special occasion quite like Mothers' Day. These are such great gifts so bright and colorful! I would love to receive flowers for Mother's Day. I think you need to start throwing some hints out there so you can get one of these beautiful arrangements. I will cook dinner for my mom! How splendid! Do you already have a menu in mind? What beautiful flowers. I love how fresh they are and the colors they coordinated! Oh and they have a lot more beautiful ones than these that I'm showing you. Just check them out. I love to send my mom flowers. We don't live far away from her - so it's a nice thing to do so she knows I am thinking about her. How sweet! And I'm sure that she appreciates it a lot. Oh that sounds lovely and I'm sure that she will love that. I am pretty sure that she would! I don't live near my mom, so mother's day plans just involve calling and talking with her. Well Hannah even though you're not close by, I'm pretty sure that she'll enjoy receiving some flowers. These are really beautiful. I love flowers on my table any time of the year, but it is fun to get a special bouquet for Mother's Day. I also love giving flowers - I know a lot of great ladies who deserve them (my mom and MIL included). Oh they most certainly deserve the best bouquet of flowers that you can get for them. I love flowers all year round as well, they just make your home not only look good but smell great too! Not familiar with Telefloras but they have some gorgeous bouquets, and though it's not mother's day anymore I wouldn't mind getting a couple for my mum. Then you most certainly should! You can get Telefora's bouquet at any time.